Due to advances in hardware technologies, mobile devices are increasingly capable of handling largescale data sets. While this development broadens the application scope of smartphones and PDAs, it also means that high information loads must be displayed on very limited screen real estate. A solution to this problem may be provided by starfield displays. Starfield displays maximize the data-pixel ratio by presenting data inside a zoomable 2-D scatterplot. However, a drawback is that once users have zoomed into the information space, they tend to become lost, due to the clipping of orientation cues. The chapter summarizes the research results of recent projects that were conducted to improve the navigation and orientation features of starfield displays on small screens. Several approaches, such as smooth zooming, overview window, and fisheye view, have been implemented and user-tested. 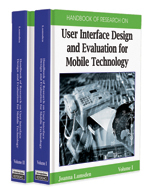 The results may support interface designers when targeting mobile devices. Overview+Detail Interface: A multiwindow interface, where usually one window is used to present details while the other one gives an overview of the entire information space. Focus+Context Interface: An interface that uses distortion to integrate both focus and context in a single view. Dynamic Queries: Graphical widgets, such as sliders and checkboxes, used to formulate queries in a direct manipulation interface. Halos: A visualization technique to indicate the position and distance of off-screen objects. Around each clipped object a ring is drawn, which is just large enough to reach into the current viewport. Speed-Dependent Automatic Zooming (SDAZ): SDAZ couples rate-based scrolling with scaling and thus combines zooming and panning into a single operation. Zoomable User Interface (ZUI): A spatial 2.5-D interface, in which data objects are organized in space and scale. Users navigate this space by performing zooming (changing the scale) and panning (movement at constant scale) operations. Starfield Display: A complex search interface that visualizes abstract data as an interactive scatterplot diagram enhanced with zooming and filter capabilities.